Do you want to be part of an authentic, original and creative real time Feature Film Production? Hurry, register for the season 2 of Unleash Ur Creativity MOVIE PRODUCTION REALITY, "The Age of Ingenuity". Can you write, tell captivating and compelling story? Are you good at editing, can you act, handle the camera well enough to shoot clean, clear and crisp motion picture, or rather, you have the charisma of that of an outstanding director? 2ET Media is calling out to Actors, Directors, Editors, Cinematographers, Light & Sound persons, Screenwriters etc to come showcase their talents. 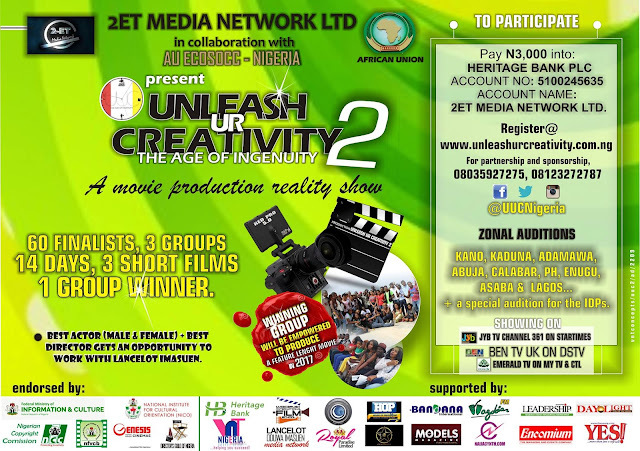 Unleash Ur Creativity Nigeria Project is endorsed by the Federal Ministry of Information and Culture (FMIC), National Institute for Cultural Orientation (NICO), the Nigerian Film & Video Censors Board (NFVCB), Nigerian Copyrights Commission (NCC) and the Directors Guild of Nigeria (DGN). Powered by 2ET Media Network and Virtues & Nobletouch Nigeria. registration closes November 28th , 2016.